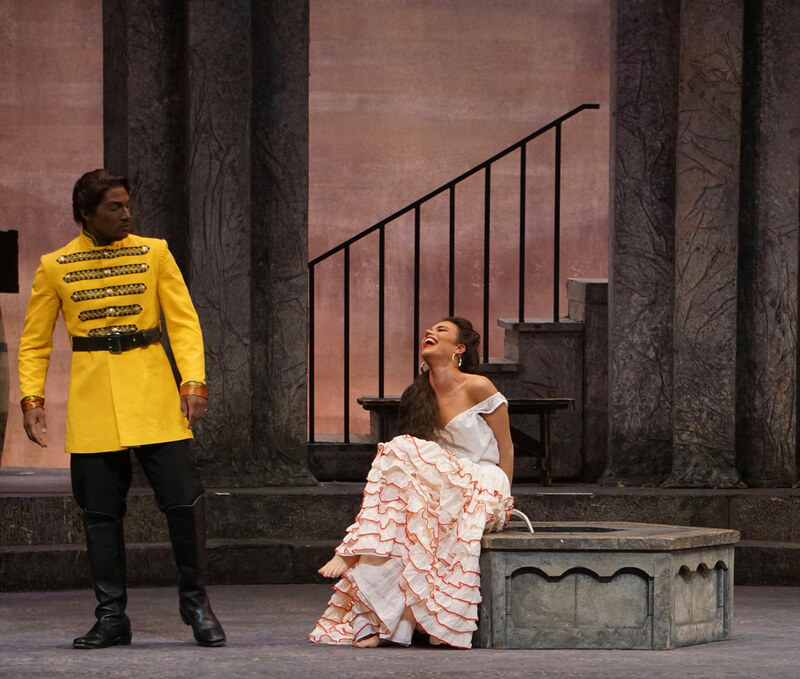 Noah Stewart and Ginger Costa-Jackson in Nashville Opera's Carmen, 2017. Photo courtesy of Nashville Opera. Nashville Opera closed its four-show, 2016-2017 season with Bizet’s Carmen. Director John Hoomes’s decision to keep a mostly traditional treatment of the production gave the musicians the space to let Bizet’s music speak for itself. While the largely talented singers seized that opportunity, it seemed – in some cases – that said space allowed the focus to come off the characters themselves. Ginger Costa-Jackson as Carmen in Nashville Opera’s Carmen, 2017. Photo courtesy of Nashville Opera. The story is all too familiar: girl meets boy, girl loves boy, when girl changes her mind…boy goes bananas. Carmen is a complicated role that requires both vocal dexterity and superior interpretive choices. Fortunately for us, Nashville Opera’s Carmen, Ginger Costa-Jackson, goes above and beyond those requirements. 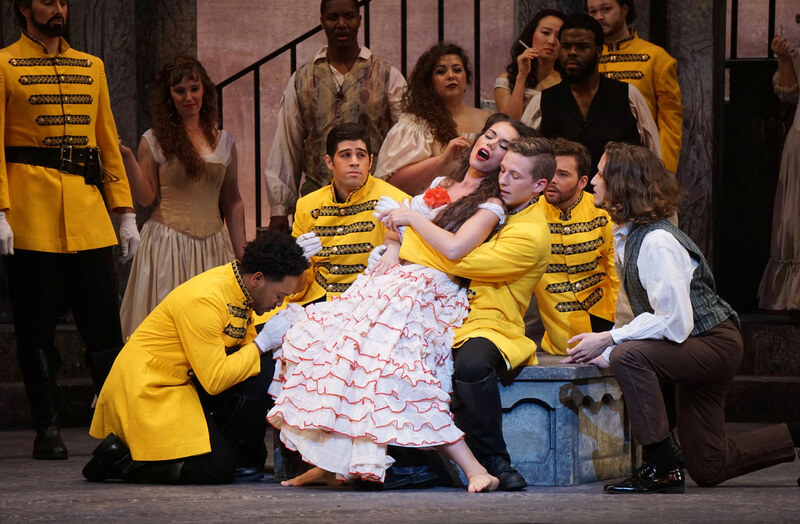 Ms. Costa-Jackson, a native of Italy who has made a name for herself singing the titular role, was enchanting as Carmen: her captivating mezzo voice was round, resonant, and vibrant. Listening to her reminds me of bowling a strike – thrilling and satisfying. Her impressive vocal (and physical!) agility and electrifying characterization made her an utmost pleasure to watch – and remained constant even throughout her taxing stage direction (her hands were bound, she jumped triumphantly up on a table, sang perfectly a difficult passage of her aria, and effectively seduced Don José – it was pretty amazing), and I want more. Ginger Costa-Jackson as Carmen in Nashville Opera's *Carmen*, 2017. Photo courtesy of Nashville Opera. Ms. Costa-Jackson’s opposite, Noah Stewart as Don José, was my favorite tenor of Nashville Opera’s season. He sounds like a tenor with the soul of a baritone – and the two were a perfect match, vocally. His voice was full and smooth, like an extra serving of caramel sauce on a sundae, and his high notes remained edgeless. I would have liked him to also match Ms. Costa-Jackson interpretively; however, Mr. Stewart’s physical depiction was not as dynamic. Ginger Costa-Jackson (Carmen) and Noah Stewart (Don José) in Nashville Opera’s Carmen, 2017. Photo courtesy of Nashville Opera. Laura Wilde’s Micaëla provided the ubiquitous contrast to Carmen. Her very bright and soothing soprano offered lightness in a way that goes beyond fach – she actually leans pretty dramatic. Her extremely clear tone mixed with warm color was a delight, as was the earnestness Ms. Wilde brought to Micaëla. Baritone Edward Parks was a delightfully smarmy Escamillo, and did justice to Carmen’s most recognizable melody. His robust voice and engaging stage presence brought welcome levity to a pretty dark show. The smattering of comprimario roles, Zuniga (Jeffrey Williams), Frasquita (Courtney Ruckman), Mercédès (Melisa Bonetti), Remendado (Zachary Devin), and Moralès/Dancaïro (Makoto Winkler) gave Nashville Opera’s Mary Ragland Young Artists a fun chance to excel in a fine production. The young singers largely did fine work (though at times, a bit clunky) – and my favorites of the bunch were Ms. Ruckman and Ms. Bonetti as Carmen’s BFFs. We remember the two from Three Way, and I liked seeing them in starkly different roles. A scene from Nashville Opera’s Carmen, 2017. Photo courtesy of Nashville Opera. 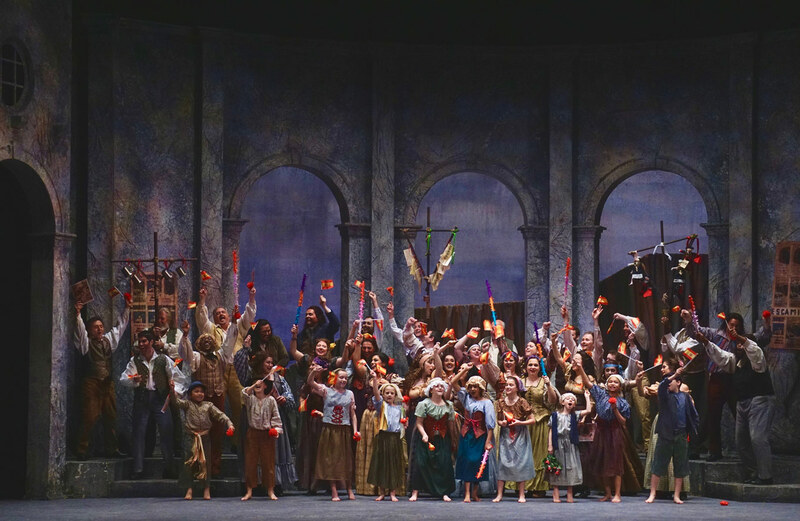 Nashville Opera’s Carmen was a good production – though, it seems Mr. Hoomes greatly prefers to stage and produce more modern operas, and excels at doing so. While the direction played a bit uninspired, the quality singers were a welcome distraction. I look forward to their 2017-2018 season announcement.